Burning of Washington in 1814 was an attack during the War of 1812 between British forces and those of the United States of America. 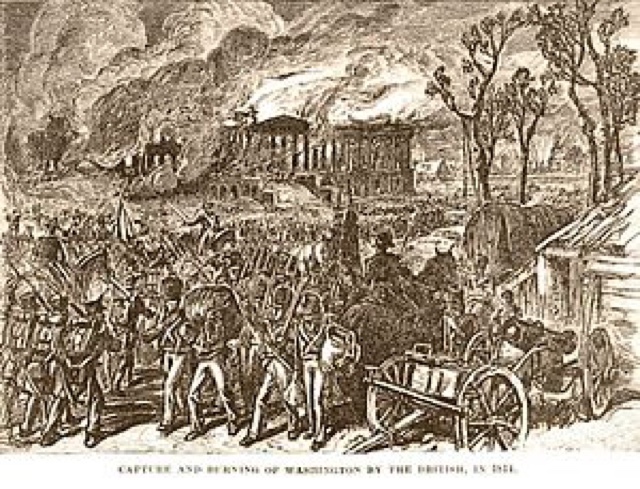 On August 24, 1814, after defeating the Americans at the Battle of Bladensburg, a British force led by Major General Robert Ross occupied Washington, D.C., and set fire to many public buildings, including the White House (The Presidential Mansion), and the Capitol. Less than a day after the attack began, a sudden, very heavy thunderstorm - possibly a hurricane - put out the fires. It also spun off a tornado that passed through the center of the capital, setting down on Constitution Avenue and lifting two cannons before dropping them several yards away, killing British troops and American civilians alike. Following the storm, the British returned to their ships, many of which were badly damaged. The occupation of Washington lasted only about 26 hours. After the "Storm that saved Washington", as it soon came to be called, the Americans were able to regain control of the city. The attack was in part a retaliation for the recent American destruction of Port Dover in Upper Canada. It marks the only time in U.S. history that Washington, D.C., has been occupied by a foreign force. President James Madison, military officials and his government fled the city in the wake of the British victory at the Battle of Bladensburg. They eventually found refuge for the night in Brookeville, a small town in Montgomery County, Maryland, which is known today as the "United States Capital for a Day." President Madison spent the night in the house of Caleb Bentley, a Quaker who lived and worked in Brookeville. Bentley's house, known today as the Madison House, still stands in Brookeville.